TBQ'S Book Palace: [Kame's ARC Review]: "Midnight Lies"
[Kame's ARC Review]: "Midnight Lies"
Be sure to check out Kame's review of book 1! Samantha Wilde is a good detective and a romantic at heart. She is in a new relationship with Quinn Braddock, an ER doctor. They have fantastic chemistry but neither has been willing to share their past heartaches with the other. This lack of sharing has an impact neither could foresee; Quinn is charged with his ex-wife’s murder and Sam’s first reaction that he might be guilty does harm to their new relationship. Then Sam takes a look at the evidence and comes to the conclusion he can’t be guilty and works tirelessly to find the evidence to prove his innocence. Before Quinn realizes it is Sam who proved his innocence she is gone, back to her hometown of Midnight. Quinn has to see her and beg for forgiveness; neither realizing his ex-wife’s murder is just the start of their challenges. Not only was I pulling for Samantha and Quinn to have an HEA in this book, but most of the characters were cheering for them too. Their work schedules were so hectic that they never took the time to talk and learn about the other, they acted on their physical chemistry without a strong base of a relationship. However it was this chemistry that kept them coming back to each other time and time again. This is not a flowery couple who profess their love to each other page after page. This is a couple who express their feelings physically more than with words. Samantha is just as strong as her sisters but lacks the confidence in her personal strength. She has dreams that she is holding on to with all of her heart; but realizes that sometimes the best way to find true love is to modify a dream. Quinn was not a perfect hero, he even comments at one point at how he is not one for grand gestures; but he realizes Sam is his one and only and he will stop at nothing to have her. Their willingness to go outside of their dreams and comfort zones is what ultimately will bring them a happiness they can’t fathom. So far they are my favorite Midnight couple! While this is the second book in the Midnight series (and I cross my fingers for at least one more book!) Ella Grace has done a great job at writing a book that can somewhat function as a stand-alone book. Are there references to plot points from Midnight Secrets – yes; will you be lost if you haven’t read Secrets – no. 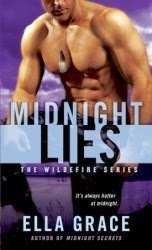 However you will enjoy Midnight Lies so much more if you read Secrets first. The beginning of this book answers the question of what caused the hurt Savannah saw in Sam’s eyes towards the end of the first book. The plot of Midnight Lies starts before Savannah and Zach reunite (Midnight Secrets), but in chapter eight the plot moves to present day and to after the ending of Midnight Secrets. I love this Midnight series. I am waiting for Sabrina, the last of the triplets, to find her HEA. There are definite plot points in this book that will appear in her story when it is finally told. Just as with Samantha there is no clear understanding what has happened to Sabrina to cause her pain and we are not sure of who her love interest might be. I just know I will keep a look out for the next book!